Apple at its latest event which was marked by the release of the long awaited and much speculated iPad mini, also showcased the latest MacBooks and iMac segment of its product line. The MacBook and the iMac certainly had some newer features like faster processors, bigger storage, retina display and of course (as Apple is known for being obsessed with thinness) the new MacBook and iMacs are much thinner than their predecessors. However, the new Macbook and iMacs have no CD/DVD drives! As you might have already guessed, these new product credit their super slimness to the sacrifice of the DVD drives that have been part of Apple computers almost ever since their inception. DVD drives have defined what we’ve come to know as computers including PCs as we’ve used them to install the operating system itself, install some software, play music and watch DVDs. But this long cherished computing history won’t stop Apple from taking a radical move to entirely eliminate what has until now been considered to be a core component of the Mac or PC! I couldn’t agree more. Watching Tech trends over the past five or so years, the way that digital content and software is being distributed today has radically changed. Today thanks to models like mobile “app stores”, software distribution is now as easy as clicking the “Download & Install” button as opposed walking to store, buying software on CD/DVD and finally installing it on your computer. The App store model popularized by the iPhone in 2008 also makes it dead easy and cost effective for developers to release new versions of their apps and distributing them to customers. In the old model of CDs, the developer would have to burn the new software on the CD and ship it to the customer further increasing on distribution costs and time of delivery. It’s not only in the mobile app stores that software is distributed without CDs but also in the Mac or PC world too. For instance, we have Google’s chrome web store, Apple’s Mac App store and the Windows store, Ubuntu Software centre, Opensuse’s software repository accessible through Yast and many others all enable users to ubiquitously download and install software in what some stores call “one-click installation”. But that’s software, how about Music, Movies and perhaps games that boost huge amounts of memory sizes? Still, the same spin that has been applied on software is also working out fine with multimedia content. 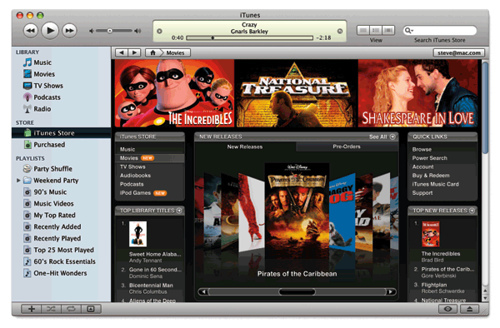 For instance the iTune store is well known for hosting thousands of podcasts, TV shows, books, music and movies. Apple has struck deals with record labels and individual artists to distribute their music in the iTune store with the same or better quality as that burnt on CDs. The iTune store also plays well with the iPod product line — something that Sony will never forget as it literally killed the then cool and sensational CD-based Sony Walkman! It’s not only the iTune store that’s a media center for music and movie lovers, but also lately, Google got serious with it’s Play store. The store now hosts music, movies, magazines, books for android users to buy and of course there’s always free stuff too. Aside from the stores, web users are well versed with video sharing sites like YouTube that have ultimately defined the best, easiest and the most cost effective way to rapidly distribute video content to a vast audience. With social media integration, we’ve seen some videos go viral and viewed by million of users almost overnight — something that’s close to impossible if the same media were to be distributed using the good old DVDs. As if to prove this point, Netflix which started out as a DVD rental service, now streams video content(movies, TV shows) directly to consumers homes through a broadband link. The company hit a home run so much so that the service is now integrated in media boxes like Apple’s Apple TV, Boxee box, Roku, TiVo, Nexus Q and many others. If you live in the US or Europe, you probably won’t need that CD/DVD drive. However, if you live in Africa and Uganda in particular, I worry for you. Why? The answer lies in the key driver of the alternatives of digital content distribution we’ve mentioned above — and that driver is without doubt — Broadband internet connectivity. Lets say you want to stream the new James Bond movie –SkyFall — from iTune store. If you live in New York, no problem, with about 5.3Mbps, you can sit back and just enjoy a smooth HD playback of the movie without buffering. If you live in South Korea, with 17.5Mbps, you enjoy the same movie in HD and you can’t tell the difference between streaming online and playing it from a storage device like a DVD. However, if you live in Kampala, with about 1.2Mbps(am just being generous here), you just got yourself some more extra movie runtime. While your counterparts in Singapore and New York watch the movie for say 2 hours, you’ll watch it for more than 3 hours thanks to slow internet connection. If you are on a data plan, you’ll end up paying five times more for data alone than for the movie itself which makes absolutely no sense at all. But we can only hope that with time, things will change (when the Telecoms also stop capping and throttling our data plans). For now though, I’ll still maintain my membership with the Movie library next door and yes I’ll still need my DVD drive!